(L-R): Mary Wilkerson, Angela Diegel, Dede Deane, Chris Balestracci, Karen Brynildsen, Michael Vitoux, Rachel S.S. Saleh, Esperanza Alzona and Jamie Douraghy. Photo Credit: Brandon Dyett. (Colorado Springs, Colo.) – The third day of the Pan American Youth and Veteran Championships saw U.S. athletes bring in a haul of 12 total medals on Friday with the U.S. women earning all four medals in both Veteran 2 (60-69) women’s épée and Veteran 1 (50-59) women’s saber. Sixty-three-year-old Gladys Berardi (Long Valley, N.J.) won her second title of the tournament, earning gold in the Veteran 2 women’s épée competition after earning the Vet 2 women’s foil gold on Wednesday. Seeded second out of pools at 2-1, Berardi defeated 61-year-old Esperanza Alzona (Frederick, Md. ), a two-time medalist in the foil events this week, by a score of 10-8 in the semifinals. She went on to win her final bout over 69-year-old Karen Brynildsen (Denville, N.J.), 10-5, to take gold. S.S. Rachel El Saleh (Houston, Texas) earned her second bronze medal of the week after the 64 year old lost her semifinal bout to Brynildsen, 10-9. In the Veteran 2 women’s saber competition, 51-year-old Mary Wilkerson (Denver, Colo.) successfully defended her 2017 title. After a 4-0 finish in pools, the 2016 Veteran World Team member defeated Berardi, 10-2, in the semis and shut out 68-year-old Dede Deane (Richmond, Va.) at 10-0, in the finals. 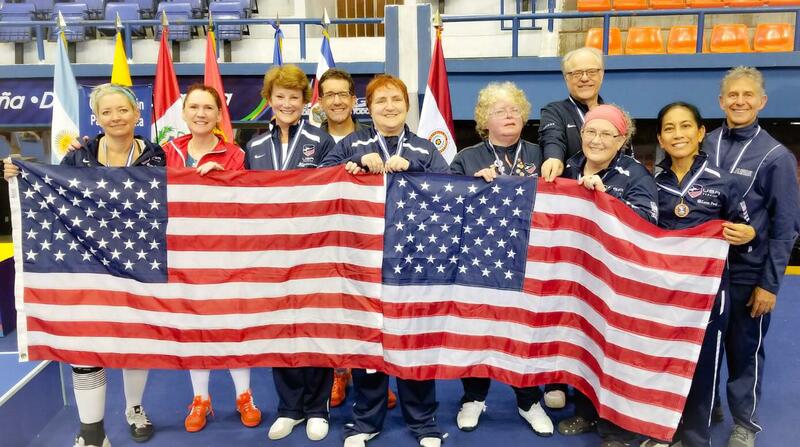 Fifty-five-year-old Angela Diegel (New York City, N.Y.) took home bronze after a 10-5 loss to Deane in the semis. Saleh lost to Berardi, 10-6, in the quarter-finals and finished fifth. Six-time Veteran World Team member Jamie Douraghy (Los Angeles, Calif.) and Chris Balestracci (Guilford, Conn.) won silver and bronze in the Veteran 1 men’s foil event. Fifty-nine-year-old Douraghy gave up just six touches in four pool bouts to take the No. 1 seed out of pools and won his quarter-final bout against Willian Alfonso (COL), 10-5, to guarantee a medal. Douraghy won his next bout against Ernesto Ramirez (ESA), 10-3, but missed the gold medal after a 10-9 loss to Carlos Covani (ARG). Balestracci also went undefeated in pools, taking the second seed at 3-0. The 55 year old took a 10-5 quarter-final win over 59-year-old Ray Blair (Naples, Fla.) who previously earned silver and bronze medals in the Veteran 1 and Pre-Veteran men’s saber events on Wednesday and Thursday. Tom Mahnken (Springfield, Va.) and David Hueske (Charleston, S.C.) also earned top-eight results. Mahnken, a 53 year old who won bronze in the Pre-Veteran (40-49) competition on Wednesday, lost to Ramirez, 10-7, in the quarter-finals. Fifty-one-year-old Hueske lost to Covani, 10-4, in the quarters. Seventy-two-year-old Michael Vitoux (Champaign, Ill.) won his third medal of the week with a silver in the Veteran 2 men’s épée event after claiming bronzes in Veteran 1 and 2 men’s saber. Vitoux defeated 60-year-old Robert Mones (North Charleston, S.C.), 10-9, in the semifinals, but lost to Mauricio Aguirre (ESA), 10-3, for gold.